Nordic Semiconductor has been named as a 2019 CES Innovation Awards Honoree in the Embedded Products category for its nRF9160 multimode LTE-M/NB-IoT System-in-Package (SiP) solution. The official announcement was made at ‘CES Unveiled New York’ at the Metropolitan Pavilion, New York, in front of an audience of industry leaders, technical media, and CES exhibitors. An annual program that celebrates outstanding design and engineering, the CES Innovation Awards recognizes honorees across 28 product categories. A panel of judges, including designers, engineers, and members of the technical media, reviewed submissions based on design, functionality, consumer appeal, engineering, and how the products compare with their competition, before arriving at the decision to honor Nordic’s cellular IoT solution. 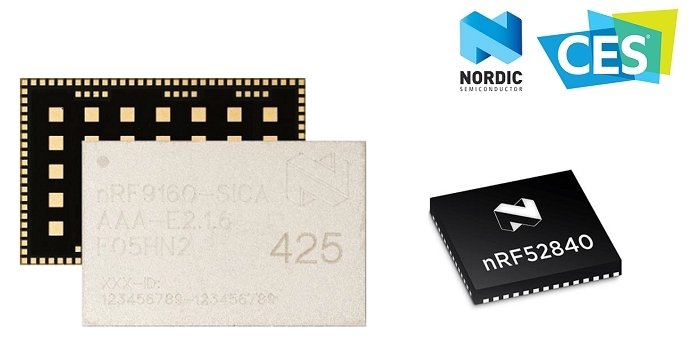 Nordic Semiconductor’s nRF9160 SiP is a highly-integrated, low power, global multimode LTE-M/NB-IoT solution. The SiP integrates a complete low power cellular IoT system into a tiny 10x 16 x 1.2mm package that integrates a modem, transceiver, RF front end, dedicated application processor, Flash memory, power management, and crystal and passive components. With this level of integration, the nRF91 SiP combines all the benefits of traditional cellular modules, including tele-regulatory and cellular certifications, with ease-of-use, unprecedented integration, and the smallest form factor ever seen in the cellular industry to date. Nordic Semiconductor expanded the application-range of Bluetooth by abstracting away from the designer all unnecessary technical complexity. The pre-certified, ready-to-drop-in LTE-M/NB-IoT nRF9160 SiP promises to do the same for cellular IoT. The CES Innovation Awards are sponsored by the Consumer Electronics Association (CEA), the producer of CES, the world’s largest and most influential technology event for the consumer sector. The CEA has been recognizing achievements in product design and engineering since 1976. The Nordic nRF9160 SiP will be exhibited - along with the full portfolio of the company’s Bluetooth 5, Bluetooth Low Energy, Thread, Zigbee, IEEE 802.15.4, ANT+ and 2.4 GHz products and customer applications based on Nordic’s solutions –– at CES 2019 which runs from January 8-11, 2019 in Las Vegas, NV.